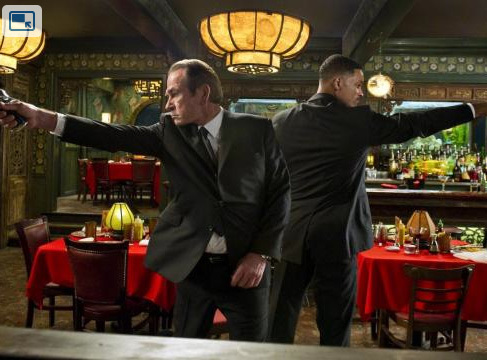 Here's a new image from MEN IN BLACK 3 that reunites Agent J (Will Smith) with Agent K (Tommy Lee Jones). This third outing brings back director Barry Sonnenfeld and also stars Josh Brolin (as a young Agent K), Jemaine Clement, Emma Thompson, Nicole Scherzinger, Alice Eve, Bill Hader and Michael Stuhlbarg. The movie hits theaters on May 25th in 3D. Agent J (Smith) time travels back to 1969 to save Agent K (Jones) from dying in the future. There he meets up with the young Agent K (Brolin), Andy Worhal (Hader) and other interesting characters including a new bad guy set in destroying the Earth.